The Easter Rising is regarded as perhaps the single most significant event in Irish history. The Irish state not only traces its beginning to the Rising, but its significance is ever-present in contemporary Ireland: from the ideology of its main political parties to national debates about societal values. The motives, strategies, and actions of the 700 men who, in the middle of the Great War, staged an armed rising in Dublin have been the subject of revisionist accounts for nearly a century. Certain facts are not in dispute: on Easter Monday, 24 April, 1916, members of the Irish Volunteers paraded up Dublin’s O’Connell Street and seized one of the most iconic buildings in Dublin, the General Post Office (GPO), while at the same time other units were taking several strategic sites around the city, including the area around Mount Street Bridge, about a kilometre from the city centre. By the week’s end, according to many accounts, there were some over 2000 civilian and rebel casualties and 400 British casualties. Dublin’s Sackville Street (later renamed O’Connell Street) looked more like Ypres than the second city of the British Empire. By employing spatial and temporal methods, the project seeks to intervene in present-day debates about the Rising, which still play a major role in shaping narratives and myths of nationhood, but which are also currently receiving critical attention in the scholarly and the popular press in the approach to the centenary. There is an abundance of documentary sources for the Rising: events were covered, as they unfolded, in the media via newspaper reports, photographs, and newsreels. During the week diaries were kept and shortly, and many wrote long letters, almost in the form of a diary, daily. Soon afterwards memoirs began appearing. Newspapers published reams of eyewitness accounts, and in the 1940s the Irish government, through the newly-established Bureau of Military History, embarked on a decade-long project which collected 1,773 eyewitness statements from combatants. These have been digitised and made publicly available, along with the Pension Records files. Together these form valuable first-hand information about the battle. However, despite (or perhaps because of) the extensive documentation, there is little agreement as to what exactly happened during key events. 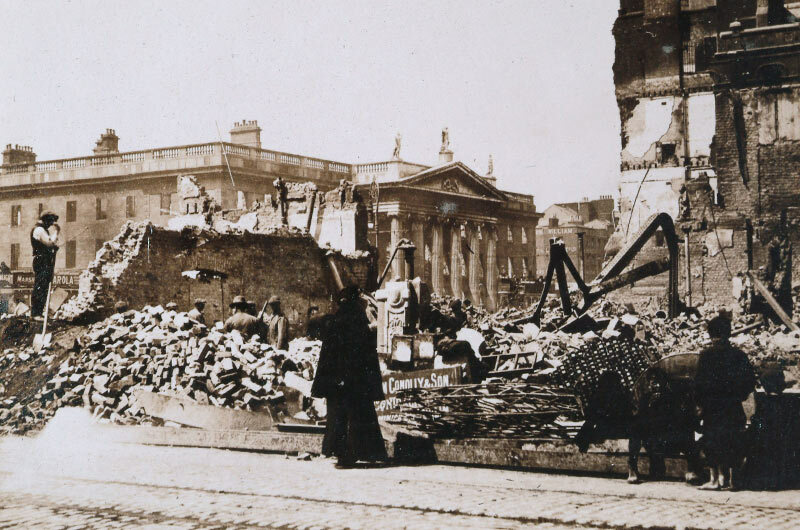 As Clair Wills has written in Dublin 1916: The Siege of the GPO, ‘The reams of ephemeral documents produced further records, and the first layer of analysis was augmented and overlaid in response to a voracious appetite for more information . . . in some cases rival accounts were politically motivated . . . Memoirs, histories, exhaustive questionnaires sent to veterans of the rebellion: all form the raw materials for our picture of what was happening . . . .’ (61). The unreliability of personal memory, further exacerbated by the significant elapsed time between 1916 and the documentation exercise of the 1940s, as well as the inevitable influence upon such accounts of ideological pressures and of popular myths that had since become ‘canonical’, render the evaluation of these eye-witness accounts challenging. In addition, the sheer volume of conflicting versions of events of varying reliability represents an almost insurmountable challenge to traditional, non-digitally-enabled methods of assessing primary sources. The assessment of the factual reliability of our sources for 1916 can thus be dramatically improved by undertaking a Virtual World-enabled, quantitative, comparative analysis of the person-space-time assertions that they contain. Testimonies with the richest multiple accounts centre on one of the most contested events of the rising: the Battle of Mount Street Bridge. This Battle has had a central place in Irish Nationalist historiography: it is claimed that, in a few short hours of the afternoon of Wednesday 26 April, approximately 230 British soldiers were wounded or killed at the hands of a handful of strategically-placed men (several of whom may, in fact, have never shot a gun before this engagement) shooting from four buildings near Mount Street Bridge. Historical accounts regularly relate that this battle accounted for half the British casualties of Easter Week. Some contemporary military historians, however, are now casting doubt on this received version of events. British casualty reports indicate approximately 25 deaths and 50 wounded. Moreover, ballistic experts question whether the Volunteers could have shot as many people as claimed using the types of rifles they had been issued and in view of the inexperience of some of the men handling arms. Although they have been working from testimonies and measuring sight-lines from where the Volunteers were situated, there has been no way, up to now to ascertain the accuracy of the assertions provided by Irish witnesses as compared to the counter accounts by British military witnesses. This project is collaborating with a group of military historians and ballistic experts who have been investigating the site of the battle, to test, empirically, within the consortium’s Virtual World platform, both ‘canonical’ Nationalist accounts and new, rival hypotheses. The simulation involves a variety of methodologies, from modeling events based on historical data, to controlling the decision making of agents via a behavior tree. The combat itself is modeled using different statistical methods and concepts from the field of game design. The simulation will run in a 3D environment developed by the Humanities Virtual World Consortium. The objective of the simulation is to allow users to modify the parameters as well as view the simulation from various vintage points (first or third person, for example, or viewing an agent from a free fly camera). It is envisioned that the parameters to be adjusted might include the general behavior of agents, accuracy of shooting, reload time, ammunition spent, average time spent in cover, and cover preferences. The project will provide scholars with new tools for the empirical assessment of the reliability of oral histories in spatially-determined situations. It will also demonstrate a significant improvement in scholarly publication, specifically: in our capacity to communicate the findings of primary source analysis in all their contradictoriness and complexity, since Virtual Worlds are not bound by the constraints of conventional linear narratives. Above all, however, the project will enable us to prove or disprove a concrete historical question of enduring symbolic importance, thereby helping to overcome the breach between accounts of this battle and how it is remembered. The Virtual World project was generously funded by the Andrew W. Mellon Foundation as part of the Humanities Virtual Worlds Consortium (2010-2015). The Digital Scholarly Editions Initial Training Network (DiXiT) provided funding for exploring digital edition features in virtual worlds. As part of the NHPRC/Mellon Foundation grant ‘Scholarship in 3D’ the virtual world is one of the four case studies to create a framework for 3D scholarly editions. History in a Box was made possible by an Irish Research Council New Foundations grant. Its development for intergenerational audiences and community engagement activities were made possible by a Science Foundation Discover grant.